It's not yet officially the "World's Largest Stick of Chalk" in the Guinness Book of World Records – but this gigantic chalk marker, created at Reed College, might soon make the grade. Fabricating this massive chalk stick were Reed College Science Majors Lorenzo Barrar, Patrick Bedard, and Alex King – according to the fourth member of the team, Trevor Schlack, who showed off their work to THE BEE in the basement of the college's Prexy Building. 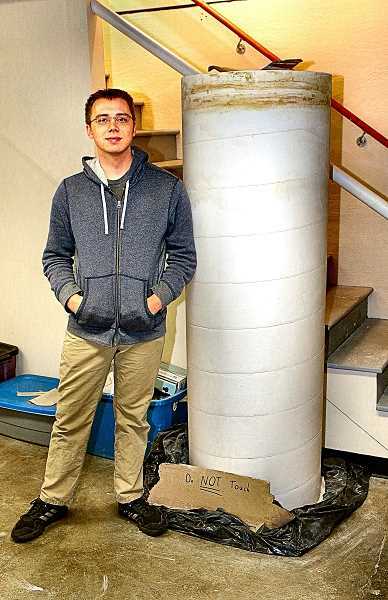 "During my freshman year, myself and friends made an oversized piece of chalk – about six inches long, and three inches thick – as a gift to a visiting professor," said Schlack, a soon-to-graduate physics senior. Using a six-foot-tall, two-foot-wide "sonotube" concrete fiber mold, the quartet enlisted as many as 30 Reed students to help continuously mix and pour batches of plaster, to complete the bucket-by-bucket pour within 45 minutes – after which the plaster would begin to set. "We've estimated that it weighs between 1,300 and 1,400 pounds, from density measurements," Schlack reported, "and its official dimensions are 6 feet and a quarter inch tall, by 24 inches in diameter." The group has documented their really big stick of chalk, adhering to the stringent Guinness listing criteria, and hope to learn if they have set a world record before the end of the school year in May. What will become of this half-ton stick of sidewalk chalk? "We're not sure; but, I did hear that an art group on campus was interested in using it for drawing – but this might not be feasible, given its weight," said Schlack.